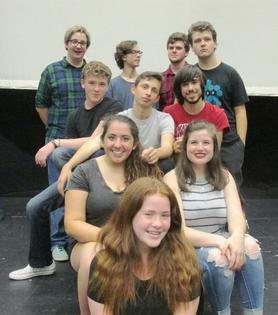 The cast comes from seven different towns in the Metro West region, including 11 actors from Medford: Craig Diskin, Brennan Miller, Darren McFadden, Derek Mangan, Kieran McFaddden, Sam Graves, Nate Vitale, Talia Andreottola, Jackie McLaughlin, Erin Diskin and Rachel Harris. Also performing in an ACT summer show is Medford resident Harry Bennett, who is in “Fame Jr.,” being performed by ACT’s 7-13 year old ACTors. Both shows are about teenagers growing up in America, but the stories they tell come from very different perspectives. Neither “Fame Jr.” nor “Green Day’s American Idiot” fit the Broadway musical tradition of happy, storybook romances and chorus lines. Instead, they use song and dance to tell the inspiring — and sometimes gritty — stories of real people. For the teenage and adult audience, “Green Day’s American Idiot,” is a post-9/11 story about three friends — Johnny, Will and Tunny — who are stuck in the suburban wasteland of their hometown. They don’t know what they want to do with their lives, they just know they want to get into the bigger world. They follow different paths as Will starts a family, Tunny joins the military and Johnny goes into the city to find love and drug addiction. The songs reflect the sadness, disillusionment and chaos felt by the characters. And the story does not shy away from difficult topics or strong language. “Green Day’s American Idiot” is a two-time Tony Award-winning hit musical based on Green Day’s Grammy Award-winning multi-platinum album. In the operatic tradition “American Idiot” has little dialogue and uses songs, actions and character behavior to tell the story. If you love rock music or have a teenager in your family, “American Idiot” is not to be missed. “Fame Jr.” features a talented cast of young performers ages 7-13 in a version of the musical suitable for audiences of all ages. Based upon the 1980s movie “Fame” and the hit Broadway musical it inspired, “Fame Jr.” is the story of ambitious teenagers who know EXACTLY what they want: to attend the High School of Performing Arts in New York City and succeed as professional singers, dancers or musicians. “Fame Jr.” follows a group of students who are accepted through their four years at this legendary high school. Audiences will be caught up in the beautiful harmonies of the songs that tell of the students’ struggles, friendships, determination and hard work. For parents in the audience, the storyline also includes the teachers’ tug-of-war over the ever-present question: Is it best for a teenager to focus solely on their artistic (or athletic) talent, or should they have high academic requirements as well? “Fame Jr.” is a fun, high-energy musical that manages to share some meaningful messages while entertaining families with children of all ages. So go next door to Arlington’s Regent Theatre, 7 Medford St., Arlington, on Aug. 6-9 for a wonderful weekend of music, dancing and fun! “Fame Jr.” runs Thursday, Aug. 6, 7 p.m.; Saturday, Aug. 8, 10 a.m. and 7 p.m.
“Green Day’s American Idiot” runs Friday, Aug. 7, 7 p.m.; Saturday, Aug. 8 and Sunday, Aug. 9, 2 p.m.
Tickets are $15, can be bought at regenttheatre.com/tickets_events or at the Regent box office.